The Joint Water Commission (JWC), owned in partnership by the Cities of Hillsboro, Beaverton, Forest Grove, and the Tualatin Valley Water District — has selected CH2M and Slayden Constructors to deliver a multi-year water treatment facility plan and expansion project for the JWC Water Treatment Plant. Over the next three years, the project will increase the capacity of the water treatment plant from 75 million gallons per day (mgd) to 85 mgd, and will also increase seismic resiliency. 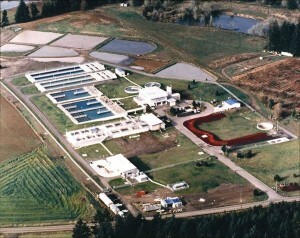 The JWC currently treats, transmits and stores drinking water for more than 365,000 customers, and is the largest conventional water treatment plant in Oregon. The primary objective of the expansion project is to increase the plant’s treatment capacity so it can provide additional water for growing communities in western Washington County. The project also involves planning for a future plant capacity of 105-mgd, which will happen over a 20 year period after the initial increase to 85-mgd plant capacity by mid-2019. CH2M will complete a Facility Plan which will lay the groundwork for the immediate plant expansion as well as phased seismic improvements and expansions until ultimate plant buildout. As part of the project, CH2M staff helped the JWC select Slayden Constructors, who will deliver the project using the Construction Manager/General Contractor (CM/GC) delivery model to assure a timely project implementation. A collaborative decision process, utilizing JWC and CH2M engineering and operations staff, and the construction experience of Slayden will craft design decisions that ensure capacity and water quality goals are met, while also keeping costs and the construction schedule on target.